As with all the aerial camera systems Blue Sky Helicopters have developed over the years, we are always striving to lift the bar. Our latest system can’t be surpassed as we are now offering (and are the only company in the world to do so) switchable multi-camera High Definition filming of your actual flight, complete with pilot narration, choreographed stereo music and Pilot/Air Traffic Control interaction. We also use top of the line BOSE A20 noise cancelling headsets for superior comfort. The footage of your flight can be taken home on a USB stick straight after your flight so you can remember your experience with Blue Sky Helicopters forever. Back in 1999, Blue Sky pioneered the original broadcast quality Helicam systems in Australia, now we have now perfected it. We are now the world leaders in onboard (real-time edit) Helicam systems, not one of our competitors offer a “true state of the art” custom built High Definition recording system like ours! We think the footage speaks for itself! 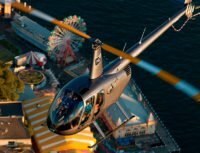 Footnote: Blue Sky is also the only helicopter company (in the world) to have full surround view doors on their R44 helicopter. Please note that the onboard video system isn’t currently available on our MD500E helicopter, however, we can supply you a handheld GoPro with audio input for $50 if you wish to record your flight experience.